Arriving at the dueling area where they found the golden ghost ship, Marika and the space pirate fleet find themselves up against three Grand Cross ships. Thanks to Coorie's hacking skills, they manage to trick the Grand Cross ships into a chaff field and destroy two of them with missiles. With Quartz distracted, Marika leads a boarding party by ramming into Quartz's ship with the pirate ship Shangri-la. 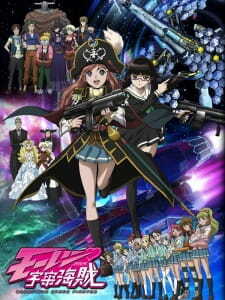 As the pirates fight the Grand Cross security drones, Marika comes face to face with Quartz. Continuing their talk about the space pirates in her region, Marika gives a speech to Quartz why they still have a right to exist. An impressed Quartz escapes with her combat data from the Grand Cross after detonating it, but not before telling Marika they should meet again in vaster seas. As the pirate fleet celebrate their victory, the Parabellum picks up the space yacht club from the Odette II where Gruier meets up with Ironbeard, which the latter is revealed to be Gonzaemon. With their battle over, Marika heads home to the Sea of the Morning Star and passes her exams, while Chiaki decides to stay at Hakuoh Academy indefinitely.